Critics and festival audiences have gone wild over this picture. Beasts of the Southern Wild won the prestigious Camera d’Or at Cannes and the Grand Jury Dramatic Prize at Sundance. It’s on the cover of the influential U.S. magazine Film Comment for May/June and young Quvenzhané Wallis is being touted for an Academy Award. Hushpuppy and her daddy Wink live in Bayou country. Their friends—a mix of white and Black Southerners—are dirt poor, drink a lot but have a lot of love for each other. Hushpuppy, a precocious 6-year-old narrates the film and soon after it begins Wink disappears for a while. She lets us know that her mother has gone for good and is clearly concerned that her father might have left, too. Wink does return—just in time to save her when Hushpuppy accidentally burns down half of their shack, trying to cook a meal. Soon after, the storms hit—presumably, Katrina. Wink, Hushpuppy and a group of their friends float downstream in a houseboat/bar on the river. Eventually, they’re captured by health authorities, who diagnose that Wink has a fatal disease. Wink, Hushpuppy and the others escape, allowing them time to give him a proper send off. Hushpuppy ends her tale, triumphant, still a resolute individual—her own person—living a hazardous but beautiful life on the bayou. 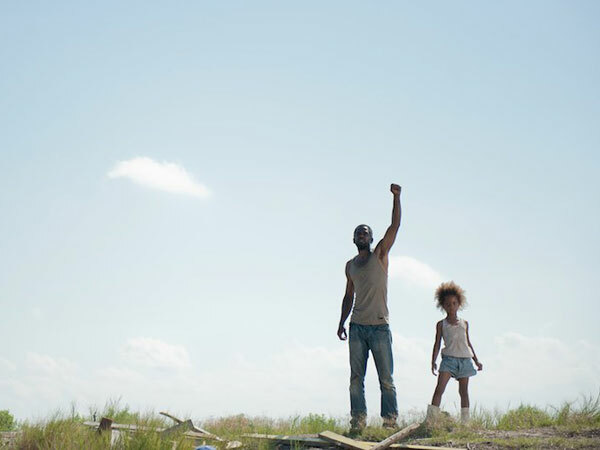 9-year-old Quvenzhané Wallis is extraordinary as Hushpuppy. The screen loves this young girl and so will the audience. She dominates the film. Dwight Henry is fine as Wink and the rest of the non-professional actors are wonderfully natural and unpretentious. Extraordinary. The premise or plot gives no sense of the beauty of Behn Zeitlin’s direction. The film is shot, scored (Zeitlin also worked on the soundtrack) and directed in a stylish manner reminiscent of Terence Malick’s approach to cinema. Nature is ever present and the camera roams relatively freely, finding the glory of the world even in the midst of grotesque poverty and deprivation. Like Malick, Zeitlin uses a child’s voice to relate the story in the film—but his approach is far more emotional than that of the director of Tree of Life and Thin Red Line. The audience feels tied to Hushpuppy and her struggles throughout the film: we share her moments of confusion and power and sorrow and love. The location on the Bayou is hardly a tourist’s eye view of Louisiana and the story often meanders. Watching Beasts of Southern Wild is an unsettling but extraordinary experience. Lovers of art cinema will flock to the film—and enjoy it. Others beware: this is a hothouse flower, not your ordinary garden-variety blossom.